Can New Federal Reserve Chairman Jerome Powell Save the Economy? 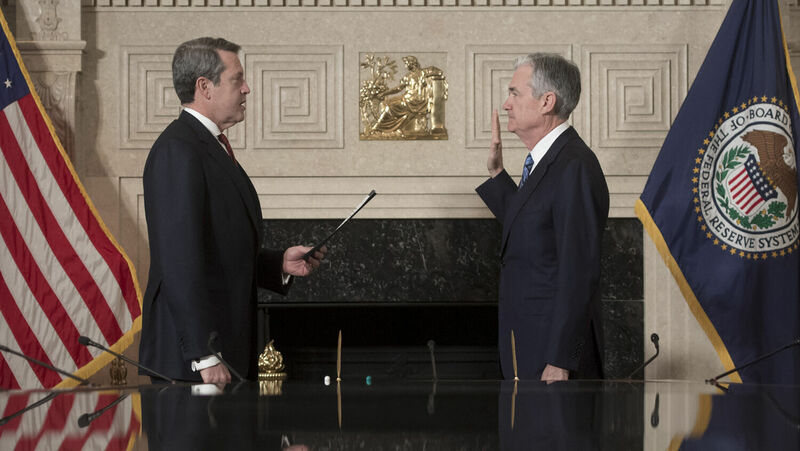 Jerome Powell (right) is sworn in as the new chairman of the Federal Reserve by Randal Quarles, vice chair for Supervision, at the Federal Reserve building in Washington, D.C., on February 5. America must wake up: It can no longer borrow enormous amounts of money without shaking financial markets. The Dow Jones Industrial Average plunged 1,175 points last Monday, its biggest one-day drop in history. After a group of private banks that advises the United States Department of the Treasury announced on January 31 that the federal government would likely have to borrow $955 billion this fiscal year, investors began dumping stocks. The ensuing turmoil wiped out over $4 trillion in value from world markets. Even though President Trump nominated Powell, some analysts expect a clash between the Trump administration and Powell’s Federal Reserve. To keep inflation low, Powell is expected to raise interest rates three to four times this year. By raising the interest rate that banks charge each other on loans, the Fed hopes to make it more expensive to borrow money, thereby keeping inflation low (which preserves the purchasing power of the dollar). But doing so could also slow economic growth. While 6 percent economic growth sounds great, attempting to achieve such rapid growth would require lower interest rates and higher deficit spending than the Fed’s current economic plan. Regardless of the exact interest rate the Fed sets, the U.S. government must wake up to the fact that it can no longer run huge budget deficits (spending more money than it receives) year after year without damaging financial markets. Since 1969, the U.S. government has recorded only five budget surpluses (spending less money than it receives in a year). It does not even plan to attempt a budget surplus in the near future. In fact, the Congressional Budget Office estimates that the national debt will soar to an incomprehensible $92 trillion over the next 30 years. Depending on what interest rates are in 2047, that means 60 to 100 percent of all individual income taxes will go toward paying just the interest on the debt. The ratio of America’s current debt compared to its gross domestic product (the sum of all goods and services it produces in one year) is now higher than at any point since the end of World War ii. Unless this ratio is lowered, fewer people, institutions and governments will buy U.S. Treasury bonds. Jerome Powell and the Federal Reserve can try to soothe investors by pushing up interest rates, but only Congress and the Trump administration can lower the national debt. This would require elected representatives to tell voters they are cutting spending and increasing taxes, a sure way to get voted out of office. While it is not necessarily wrong to temporarily go into debt, the Bible tells us that it is wicked to borrow money without a plan to repay the lender. “The wicked borrows, and cannot pay back, but the righteous is generous and gives; for those blessed by the Lord shall possess the land, but those cursed by him shall be cut off” (Psalm 37:21-22; Revised Standard Version). America’s addiction to deficit spending is leading to a time when people shall be “cursed” and “cut off” from their land. America’s current economic woes are not the root cause of its problems; they are one of many symptoms that point to the greater problem of rebellion against God’s law. To learn more about what the Bible foretells about America’s future, request The United States and Britain in Prophecy, by Herbert W. Armstrong.